KFC releases finger lickin' good nail polish | HELLO! 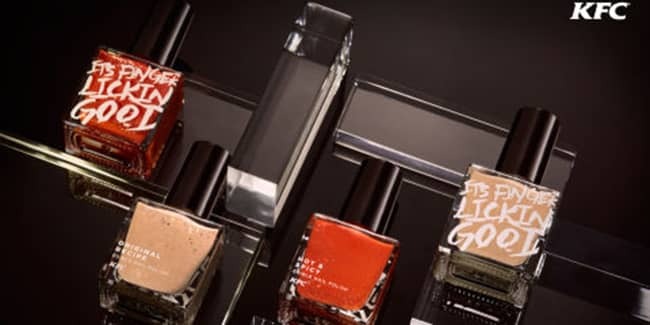 KFC is known for their chicken restaurants, but now the fast-food chain is trying a somewhat surprising new venture: conquering the beauty world with edible, KFC-flavoured nail polish. The controversial decision to create the flavoured nail polish was announced by AdWeek, who reported that KFC are launching their delicious new nail polish to help promote the restaurant chain. With help from food technologists at McCormick, who created KFC's secret chicken recipe, the food chain are ensuring that the nail polish tastes and smells exactly like their famous chicken. There are even two flavours available to try while nibbling your nails: original and Hot & Spicy, although the line of nail polish will only be available in Hong Kong. However, this hasn't stopped curious beauty fans from discussing the latest trend online. Taking to Twitter, one user wrote: "Did you see that there is KFC flavoured nail polish? I mean that is the world we live in now", while another wrote: "if KFC makes chicken flavoured nail polish can cinnabon make cinnamon roll flavoured nail polish please". KFC has claimed that their nail polish is "unique" and will "hold the flavour"
Creative director John Koay spoke about the idea to create 'finger lickin'' nail polish, saying: "The recipe for our edible nail polish is unique and was specifically designed to hold the flavour, but to also dry with a glossy coat similar to normal nail polish." KFC has also released helpful instructions about how to apply the flavoured nail polish, writing: "Simply apply and dry like regular nail polish and then lick - again and again and again to taste why the world's favourite chicken is Finger Lickin' Good."